Once again, the formidable Melbourne Boomers join forces with Maddie Riewoldt’s Vision to present a family match day with proceeds going to fund further quality research into Bone Marrow biology. There is a wonderful story behind the power of this purple partnership. Joe and Fiona have become passionate fans of the Boomers and in particular, both are looking forward to the teams home game against Townsville on Sunday, November 18th when all supporters will be asked to get their purple on to help celebrate Maddie Riewoldt’s Vision. Speaking about the pride that the Boomers have in partnering with Maddie Riewoldt’s Vision, Boomers Assistant General Manager Lauren Jackson knows the MRV game on November 18th will be a huge day for the club. 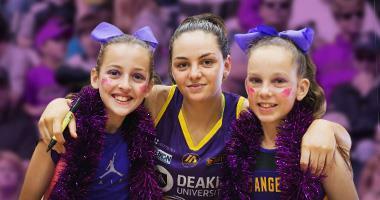 “Our fans are the best supporters in the league, it will be a sea of purple for Maddie and the game will be televised live on Fox Sports,” said Jackson. This Sunday, November 18th, the Boomers will again be encouraging everyone to dress in purple in support of Maddie Riewoldt’s Vision and all suffering Bone Marrow Failure. Tip off is at 1pm at the State Basketball Centre in a Grand final rematch against Townsville Fire. To join Joe and Fiona as Boomers members, go to boomersmemberships.com.au today and join the Boomers Family. For tickets to this Sunday’s game please visit trybooking.com/BOOMERS.